The first costume reveal from Green Lantern is here, and it's probably different than you expected it to be. Warner Bros. and DC Comics have been teasing comic fans for a while, with details slowly emerging about the upcoming Green Lantern movie. Up until now, fans haven't been able to see how the costume would look on Ryan Reynolds because it's going to be largely computer-generated. 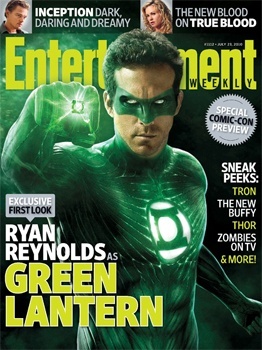 The upcoming issue of Entertainment Weekly reveals the costume, which is certainly different from how it looks in the comics. There are similarities between this outfit and the one sported in print — the chest symbol, the ring, and the mask — but this is still fairly original. The issue of Entertainment Weekly is due out tomorrow, and presumably the costume design will be just one of several elements discussed in the article. What will be interesting to see to see is how Sinestro and Parallax look, as well as the rest of the Green Lantern Corps. No two members of the Corps sport the exact same look, but they generally keep a similar uniform motif, meaning there could be some crazy character designs. If Jack Chance gets a cameo and appears as he did in the comics, my inner comic nerd will be satisfied. It's certainly not unusual for a superhero's costume to get an overhaul when it hits the big screen, but I'm not convinced this was the right direction. What say you about the costume: On Target or Off Track?